about 1906 as part of the photo of Charles W.
Pace, Sr. on the first page of this album. 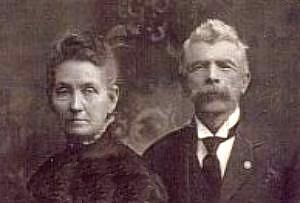 Edward Alexander Pace was born March 01, 1847 in Indiana, and died in 1926. He married Nancy Ann Davison. She was born 1852 in Iowa, and died in 1928. Alice M.11 Pace, born May 13, 1870 in Iowa; died August 03, 1893. She married Charles Love. Charles Hardin Pace, born 1873 in Iowa; died 1945 in Los Angeles, California. Harley T. Pace, born 1876 in Iowa; died 1926. He married Minnie Long; died 1946 in Los Angeles, California. Myrtle Pace, born 1879 in Iowa; died 1900 in Houston, Texas. She married ? Valentine. Ersa Pace, born 1883; died 1957 in Medford, Oregon. She married Frederick Foster. Asa Pace, born 1889; died 1970 in Los Angeles, California. 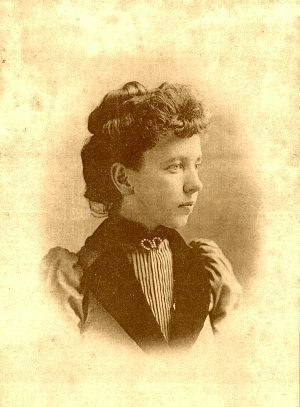 The only photo of Edward Pace's descendants that we have, other than the possibility of Frank Valentine in the main photo, is this photo of Ed's daughter Ersa Pace, probably about 1895. We would welcome any other photos of Ed and Nancy's descendants.